@allysin_kay vs Veda Scott at @aiwrestling's, Hikaru Shida leaving Ice Ribbon, TGIF, @FutureLegendCF vs @wgathena06 vs @SassyStephie at @RemixPro on April 26th, @WSUWrestling's "Mutiny," @LuFisto & More, Mercedes Martinez, Evie & Kellie Skater added to @NHPWPerth's Global Conflict, @SHINEWrestling SHINE 16 Updates, @MRayneTNA & the Knockouts, JWP Tag League The Best kicked off, Dissension in Monster-gun in STARDOM, Veda Scott takes on Portia Perez for @WI_Respect, Upcoming events, Results & More. Follow @Ciara92189 on Twitter. ►Candice LeRae and Joey Ryan will take on Adam Cole and Kevin Steen in the first round of Pro Wrestling Guerrilla's DDT4 Tag Team Tournament on January 31st. ►Sassy Stephie, Cheerleader Melissa and "The Wrestling Goddess" Athena will meet come April 26th for REMIX Pro Wrestling's "Throwdown For the Pound 9:Full Dog House" as one woman will walk away as the first ever Women's Fury Champion. ►Seleziya Sparx will take on Veda Scott at SMASH Wrestling's "Any Given Sunday 2" on January 26th. This will be a rematch from SMASH's "CANUSA Classic" back in September as Scott took the win for Team USA. ►Justine Silver takes on Barbi Hayden on January 11th for UPROAR Pro Wrestling's "Collision Course." 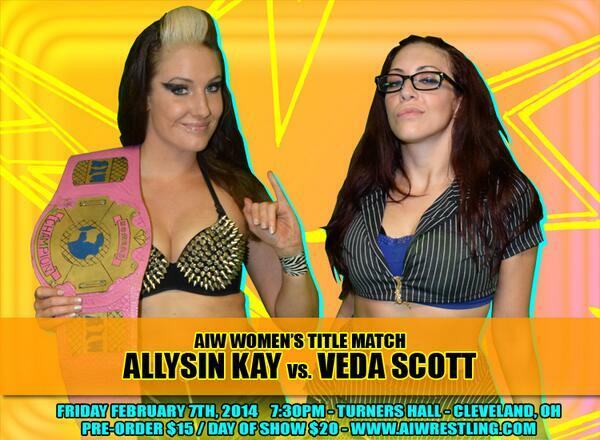 ►Absolute Intense Wrestling has announced that there will be a rematch from Girls Night Out 10, with Allysin Kay defending the AIW Women's Championship against Veda Scott at "TGIF" on February 7th. ►Kimber Lee and Drew Gulak collide for Beyond Wrestling's "Feeding Frenzy" on February 16th. ►LuFisto takes on Candice LeRae for Alternative Wrestling Show on March 22nd. ►Veda Scott's opponent for Wrestling Is RESPECT on January 19th will be Portia Perez. Scott issued an open challenge to any competitor for the upcoming show over a month ago and Perez answered. ►The RESISTANCE Pro Women's Championship will be on the line January 17th at "Vulgar Display Of Power" as D'Arcy Dixon defends against Thunderkitty. Also, "Crazy" Mary Dobson will be in action against Mickie Knuckles. ►Christina Von Eerie and Candice LeRae will team up for Quistessential Pro Wrestling on February 1st against "Pretty" Peter Avalon and Ray Rosas. ►LuFisto and Athena are the latest competitors announced for Women Superstars Uncensored's "Mutiny" on February 8th. Allysin Kay and Sassy Stephie's WSU Tag Team Championship will on the line, as they defend against Annie Social and Kimber Lee, the Midwest Milita must defend their titles or will be stripped of the championship. Candice LeRae & Joey Ryan will also be in action. ►Hikaru Shida is leaving Ice Ribbon. Days after the promotion's year-end event, "RIBBONMANIA," reports surfaced that the current International Ribbon Tag Team Champion was leaving the promotion after six years to become a freelancer, where she would have more control of her bookings, seeking business elsewhere. Shida announced her resignation on Saturday after she and Tsukasa Fujimoto, known collectively as "Muscle Venus," made their fourth successful title defense against Kurumi and Kyoko Inoue. Like majority of Ice Ribbon's brass, Shida was trained at the hands of founder, Emi Sakura. Breaking in back in 2008, Hikaru Shida worked solely for Ice Ribbon, a former ICEx60 Champion(longest reigning champion in history of the title) and four-time International Ribbon Tag Team Champion wrestled a total of one-hundred twenty-six matches in 2010, the following year amounted to one-hundred eighteen matches. Over the years Shida made appearances for TAJIRI's defunct SMASH, Pro Wrestling WAVE, OZ Academy, SENDAI Girls and REINA Joshi Puroresu and other promotions, representing Ice Ribbon. In 2013, Hikaru Shida held the WAVE Tag Team Championship(with Yumi Ohka), OZ Academy Tag Team Championship(with Aja Kong) and the International Ribbon Tag Team Titles simultaneously. Shida also made her debut in the United States as part of the SHIMMER Women Athletes Volumes 58-61 tapings in October, defeating Mia Yim on Volume 58 and Nicole Matthews on Volume 60. Though Shida's departure is another dagger into Ice Ribbon roster, its possible Shida will continue to compete for the promotion, but not full-time. Over in Pro Wrestling WAVE, she has forged a partnership with Yumi Ohka, Muscle Venus made it to the finals of the 2013 Dual Shock WAVE, as Las Aventureras(Ayako Hamada and Yuu Yamagata) defeated Shida and Fujimoto and Kana and Yumi Ohka in a three-way match. Back in 2012, Emi Sakura left Ice Ribbon and headed off to Thailand to start Gatoh Move Pro Wrestling. Sayaka Obihiro and Riho would follow Sakura's lead, with both competitors jumping to Gatoh Move. With Sakura's departure in 2012, Shida and Fujimoto became the head trainers for the promotion, bringing in the likes of Risa Sera, Rutsuko Yamaguchi, 235 and Shoko Hotta and much of Ice Ribbon's rookies. Shida and Fujimoto's next title defense has been set for February 15th. Hikaru Shida's last match as a member of the roster will be on March 30th against Tsukasa Fujimoto, as Muscle Venus will be dissolved. More matches for OZ Academy's "The Wizard Of OZ" this Sunday at Shinjuku FACE have been announced. Joining the previously announced matches of Aja Kong and Dynamite Kansai taking on Mayumi Ozaki and Mio Shirai and the OZ Openweight Championship match between AKINO and Sonoko Kato, Manami Toyota and Carlos Amano will take on Mima Shimoda and Tomoka Nakagawa, Tsubasa Kuragaki and Hiroyo Matsumoto will face Kagetsu and Sareee and Chikayo Nagashima will face Yumi Ohka. JWP's Tag League The Best 2014 commenced on Sunday at the Itabashi Green Hall. The teams of Rabbit Miu and Tsukushi, KAZUKI and Rydeen Hagane, Command Bolshoi and a partner to be announced and Arisa Nakajima and Kana for Block A, Kayoko Haruyama and Manami Katsu, Leon and Ray, Hanako Nakamori and Takako Inoue and Sachie Abe and Yako Fujigasaki for Block B would be participating in this year's round-robin tournament, with the winners taking on DASH Chisako and Sendai Sachiko(Jumonji Sisters) for the JWP Tag Team-Daily Sports Women's Tag Team Championship at a latter date. Matches for Chigusa Nagayo's upcoming produced event on March 22nd have been announced, Sakura will take on Eiger, Misaki Ohata, Mio Shirai and Tsukasa Fujimoto will be paired against Hiroyo Matsumoto, Ryo Mizunami and Rina Yamashita. DASH Chisako and Sendai Sachiko will be up against Natsuki*Taiyo and Io Shirai, Kyoko Inoue and Sareee will meet Yumiko Hotta and Mima Shimoda in a DIANA showcase, Shinobu Kandori, Meiko Satomura and Toshie Uematsu will take on KAORU, Takako Inoue and Ayako Hamada and Chigusa Nagayo, Kagetsu and Takumi Iroha take on Dump Matsumoto, KAORU and Yoshiko. The current champions were last year's winner, defeating Morii and Hanako Nakamori in the finals. On Sunday, Rabbit Miu and Tsukushi or "Haruusagi" and Manami Katsu and Kayoko Haruyama picked up the first victories in the tournament, going over Abe and Fujigasaki and Nakajima and Kana respectively. Rabbit Miu capitalized on the "mistaken" kick from Kana to Nakajima, it was reported that Nakajima nominated Kana as her partner for the tournament, amidst their squabbles over the JWP Openweight Championship. Dissension in Monster-gun came to fruition on World Wonder Ring STARDOM's show on Saturday. Beginning back at "Year-End CLIMAX" in December, Act Yasukawa successfully retained the Wonder Of STARDOM Championship against Kellie Skater, the rest of her cohorts didn't have the duplicate success as Alpha Female, Ayesha Ray and Kyoko Kimura dropped the Artist Of STARDOM Championship to Miho Wakizawa, Hiroyo Matsumoto and Mayu Iwatani as Iwatani got the pinfall on Ray. The Artist Of STARDOM Championship lost on their first defense, with the shortest reign in the title's history at 55 days, the frustration has built. Back in March, the previous incarnation of Kimura's Monster-gun which included Hailey Hatred, in one fell swoop collected championships at "Ryogoku Cinderella" with Hatred and Kimura taking the Goddesses Of STARDOM Championship and Alpha Female snatching the "red belt" from Nanae Takahashi. Forty-three days later, Monster-gun lost all their championship at "Stardom The Highest" on their first title defense, with Io Shirai taking the World Of STARDOM Championship and Kairi Hojo and Natsumi Showzuki taking the titles from Kimura and Hatred. In June, Kimura, Hatred and recruit Christina Von Eerie lost to capturing the vacant Artist Of STARDOM Championship to Kaori Yoneyama, Yuhi and Kairi Hojo, from there leader, Kyoko Kimura unsuccessfully challenged Shirai for the "red belt." With Act Yasukawa defecting from the STARDOM roster into the stable and the championship collection back on November 4th, it appeared that Monster-gun was on the steady track to rule the roost in the promotion, but it came to a screeching halt. On December 23rd, Kimura and Yasukawa took on Nanae Takahashi and Miho Wakizawa for the Goddesses Of STARDOM Titles, after Yasukawa and Kimura defeated Alpha Female and Ayesha Ray in the finals of the third annual tournament for the number one contendership to the titles, the champions retained, with Alpha Female taking the loss to Takumi Iroha earlier in the night. Another championship that Monster-gun could have possessed within their grip, with either Alpha Female, Ray or Yasukawa knocking at an opportunity for Shirai's championship, but instead Act Yasukawa is the only member with a championship currently and all four members will settle their differences in a four-way, as Ayesha Ray and Alpha Female got into a bit of a scuffle after the main event on Saturday as Shirai, Takahashi and Hojo defeated Kimura, Ray and Yasukawa. Will Kimura's stable remain in form or crumble after Sunday, or will the winner stand afoot as the strongest of the stable as Alpha Female or Ayesha Ray cementing their self as the "monster" in the STARDOM, it's tricky. ►Portia Perez battles "Princess" Kimber Lee at Wrestling Is Fun! on January 18th. ►Championship Wrestling Entertainment is set to crown the inaugural CWE Vixen'sChampion on February 7th, as there will be tournament, 'Battle Of The Vixen's," involving Devyn Nicole, Cherry Layne, Calypso, Justine Silver and Lena Taylor with the winner becoming the first ever CWE Vixen's Champion. this time around Madison Rayne is taking the lead role as the next opponent for Gail Kim's championship. Almost four weeks into the storyline, TNA has not, or Rayne rather explained the reasoning for the issue between the two former partners. But whom am I to question the company's inability to provide a back-storyto a feud between the current champion of the division and the challenger that is "out for blood," but for whatever rhyme or reason nobody has a gumption as to why Rayne wants vengeance?-The Knockouts division is in shambles and has reached it's lowest point, despite losing a heap of competitors over the last two years. The Knockouts have longed provided the in ring work, the compelling storylines that you could "sink your teeth into," besides the rivalry between Kim and Taryn Terrell, Mickie Jame's heel turn and Brooke Tessmacher's Cinderella story the year earlier, the division has lacked in intrigue. Perhaps the division needs an influx of "newbies" brought in, the current roster consists of Gail Kim, Lei'D Tapa, ODB, Madison Rayne, Tessmacher, Velvet Sky(currently wrapped up in a storyline with Chris Sabin) and Taryn Terrell(currently pregnant), all have which won the Knockouts Championship on multiple occasions, except Terrell. Sky and Tessmacher had two reigns, Gail Kim is in her third reign, ODB and Rayne have four, at this rate the constant shuffle of the title between the same competitors is "no buys." Madison Rayne takes on Gail Kim for the TNA Knockouts Championship on next week's "Genesis" edition of Impact Wrestling. As if the Knockouts division needed another departure, twins, Holly and Hannah Blossom revealed on their Facebook that they had left TNA and Ohio Valley Wrestling all together as they are "taking a little break from wrestling." Starting out back in 2005, the Blossoms wrestled for promotions in the United Kingdom before landing a break in OVW in 2009, as Hannah defeated Epiphany for the OVW Women's Championship in her debut for the promotion. Holly would have her turn with the OVW Women's Championship in 2010, while her sister had already attained a second run the previous year. In January of 2013, the Blossoms participated in TNA's British Bootcamp, along with Marty Scrull and current employee, Rockstar Spud as the winner of the competition received a contract with TNA. Ahead of British Bootcamp, the twins returned to OVW in October 2012 after a year's absence. With Rockstar Spud as the winner of the competition, he accompanied the twins in TNA's then developmental territory, OVW, despite their success in OVW, it dint translate over in TNA as the Blossoms made sporadic appearances at the least. It appeared the one twin was "favored" over the other, as Hannah Blossom made three appearances without her sister. For starters, Hannah defeated Sojo Bolt and then contracted talent Taeler Hendrix, as part of Knockouts Knockdown, though the "one night only" special was geared to crown the "Queen of the Knockouts" as the winners advanced to the battle royal. Again Holly was absent from the pre-taped show and Hannah was eliminated first. Hannah picked up another loss to Lei'D Tapa as part of the World Cup of Wrestling and unsuccessfully answered Gail Kim's Open Challenge on November 14th. Besides their endeavors with TNA, Hannah Blossom captured the OVW Women's Title for a third time back in September as part of a Fatal Four-Way Ladder Match for the vacant title, involving Holly, Tapa and Hendrix. Blossom dropped the championship to Lei'D Tapa a month later. ►In Europe, Courtney Rush's BellaTrix World Championship will be on the line indefinitely come March 2nd as Rush defends against Liberty. Rush was originally slated to defend the championship against the challenger for BellaTrix 7 back in October, but Rush's untimely collarbone injury the card was reshuffled and title match was scrapped. Instead, Liberty's RQW European Women's Championship was put on the line against Sammi Baynz, as Baynz was originally pitted against Erin Angel for the BellaTrix British Championship. The rearranged card featured Erin Angel defending against Penelope, Baynz against Liberty, Mercedes Martinez defending the nCw Femmes Fatales International Championship against Miss Mina and the non-title match between Saraya Knight and Cheerleader Melissa. With the referee knocked out, Courtney Rush entered the ring and counted and began to count Liberty's pinfall over Baynz, Rush stopped after two and sucker punched the champion, as Baynz ceased the opportunity and covered Liberty for the victory and became the new RQW European Women's Champion. It turned out the decision for Baynz's championship win came at the hands of the promotion's co-owner in Axl Lynch, as Lynch stood next to Baynz and Rush as his champions reigned supreme, ushering in the new era of BellaTrix. Besides the aforementioned title match, Sammi Baynz making her first title defense against Blue Nikita, there will be a 30-Woman Rumble at BellaTrix 8. The winner will get a shot at the European Championship at BellaTrix 9 in June, whether the champion be Baynz or Nikita. Also, Nikki Storm will be taking on Sakura Lily for International Pro Wrestling:United Kingdom show on February 22nd, as the show will feature competitors from England taking on competitors from Scotland. The fifteen participants for Leicester Championship Wrestling Roses' Roses Rumble on January 25th have been announced, Pollyanna Peppers, Violet Vendetta, Erin Angel, Nikki Storm, Addy Starr, Princess Nadia Sapphire, Rhia O'Reilly, Kay Lee Ray, Carmel Jacob, Viper, Jenna, Felony and Shauna Shay will all compete in the main event of the show. Over in Australia, Evie, Kellie Skater and Mercedes Martinez have been added to New Horizon Pro Wrestling's Global Conflict Tournament, joining "Sweet" Saraya Knight and Madison Eagles. Speaking of Evie, her New Zealand Women's Championship will be on the line this Saturday at Impact Pro Wrestling's "New Years Takeover" against a mystery opponent. This will be Evie's last appearance before heading off to Japan for training and competition under World Woman Pro-Wrestling DIANA. Miami will be making her debut for United Pro Wrestling on February 22nd as part of "Origins." Representing Hard Way Inc, Miami will take on the promotion's Storm(Toni Storm). Jessie McKay and Kellyanne English will meet at Pro Wrestling Alliance’s "Robbie Eagles Vs The World" on January 25th. ►Santana Garrett lost the Florida Cruiserweight Championship on Sunday. Chiseled Chase defeated Garrett, Lince Dorado and Josh Hess in a Four-Way Elimination match for the title, getting the Hurricanrana pin on Garrett and the Chiseled Driver on Dorado. ►Championship Wrestling Entertainment is set to crown the inaugural CWE Vixen's Champion on February 7th, as there will be tournament, 'Battle Of The Vixen's," involving Devyn Nicole, Cherry Layne, Calypso, Justine Silver and Lena Taylor with the winner becoming the first ever CWE Vixen's Champion. ►More matches have been revealed for SHINE Wrestling's "SHINE 16" on January 24th, Jessicka Havok and Allysin Kay will collide yet again, this time in a No Disqualification, Anything Goes Match. Their previous encounter at SHINE 15 ended in a double disqualification after both competitors assaulted the referee. Kay continued to inflict punishment towards Havok's left knee, sandwiching it between a steel chair as Kay stomped on it. Also at SHINE 16, The SHINE Championship will be on the line as Rain's fifth title defense will come against The Valkyrie's Ivelisse. At SHINE 15, Rain retained her championship against Amazing Kong and opted to not retire, as the main event was supposed to be Rain's last match as an active competitor, the champion even issued her thank you's to the audience in attendance, watching and to her cohorts within her stable for their support over the past thirteen years. With Rain calling off her retirement, Vice President Lexie Fyfe announced that the SHINE Championship will be on the line at SHINE 16 as Rain will be defending against number one contender, Ivelisse, as Ivelisse defeated Mia Yim earlier in the night. Allysin Kay and Taylor Made questioned Ivelisse's decision on whether she will take the match or forfeit out of respect to Rain and the Valkyrie as an unit. Despite the discouragement, Ivelisse made the decision to challenge Rain head-on for the championship, as win or lose the title will still be within in the grips of The Valkyrie. Leah Von Dutch will be taking on Angelina Love. Serena Deeb will be making her debut in the promotion, Su Yung, Amber O'Neal, La Rosa Negra, Heidi Lovelace, Leva Bates, Santana Garrett, Taylor Made, Mercedes Martinez, Daffney's All Star Squad in Amazing Kong, Kimberly, Solo Darling, and the S-N-S Express of Sassy Stephie, Neveah and Jessie Belle will apart of the card on Friday, January 24th on WWNLive.com. ►Madison Rayne def Gail Kim(c) on TNA's Impact Wrestling(January 2, 2014). ►Nikki Bella def Aksana on WWE's Friday Night Smackdown(January 3, 2014). ►STARDOM(January 4, 2014): Mayu Iwatani def Koguma /Alpha Female def Takumi Iroha / Hiroyo Matsumoto def Kellie Skater and Yoshiko/ Mitsuo Momota & Chikara def HIROKI & Gabai Jiichan /Natsuki*Taiyo def Miho Wakizawa / Io Shirai, Nanae Takahashi & Kairi Hojo def Kyoko Kimura, Act Yasukawa & Ayesha Ray. ►Scottish Wrestling Entertainment(January 4, 2014): Nikki Storm def Debbie Sharpe/ Viper def Sammii Jayne. ►Ice Ribbon(January 4, 2014): Mio Shirai & Miyako Matsumoto def 235 & Kaho Kobayashi /Shu Shibutani def Neko Nitta / Maki Narumiya & Risa Sera def Cherry & Meari Naito/ Hamuko Hoshi def Tsukushi / Hikaru Shida(c) & Tsukasa Fujimoto(c) def Kyoko Inoue & Kurumi. ►Kacee Carlisle(c) def Jessie Belle at NWA Smoky Mountain(January 4, 2014). ►Gatoh Move(January 4, 2014): Emi Sakura def Peppermint /Tsubasa Kuragaki def Kotori /Aiger def Sayaka Obihiro / Riho vs Sareee went to a time limit draw/ Emi Sakura def Kaori Yoneyama and Hiroshi Fukuda /Kaori Yoneyama def Emi Sakura. ►Mia Svensson def D’Arcy Dixon via DQ at Ring Wars Carolina(January 4, 2014). ►Wrestling New Classic(January 4, 2014): Mio Shirai def Kaho Kobayashi/ Lin Byron def Takuya Kito and Mio Shirai/ Syuri & Hikaru Shida def Makoto & Koharu Hinata. ►Lei'D Tapa def The Bodyguy(c) at Ohio Valley Wrestling(January 4, 2014). ►Yumiko Hotta Produce(January 4, 2014): Tadahori def Hamuko Hoshi and Kyusei Ninja Ranmaru /Manami Katsu & Sareee def Dump Matsumoto & Keiko Aono /Marcela def Mima Shimoda / Kyoko Inoue & La Comandante def Arisa Nakajima & Yumiko Hotta. ►Devyn Nicole def Jessie Belle at Beyond Wrestling's "Sleeper Cell"(January 4, 2014). ►Dark Angel, Estrellita & Goya Kong def Amapola, Princesa Sugheit & Tiffany atCMLL(January 5, 2014). ►Pro Wrestling WAVE(January 5, 2014): Rina Yamashita def Sumire Natsu / Tsukasa Fujimoto def Mio Shirai / Ryo Mizunami & Tomoka Nakagawa def Shu Shibutani & Cherry and Moeka Haruhi & Hamuko Hoshi / Yumi Ohka, Kana & Hikaru Shida def Kyusei Ninja Ranmaru, Miyako Matsumoto & Fairy Nipponbashi / Ayako Hamada & Yuu Yamagata def Mika Iida & Sawako Shimono/ Misaki Ohata def Kyoko Kimura. ►DIANA(January 5, 2014): Cherry def Seleziya Sparx /Yuiga def Jenny Rose /Mima Shimoda def Sareee /Jaguar Yokota & Kaoru Ito def Mask de Sun & Keiko Aono/Kyoko Inoue & Tomoko Watanabe vs Yumiko Hotta & La Commandante ended in a double count-out. 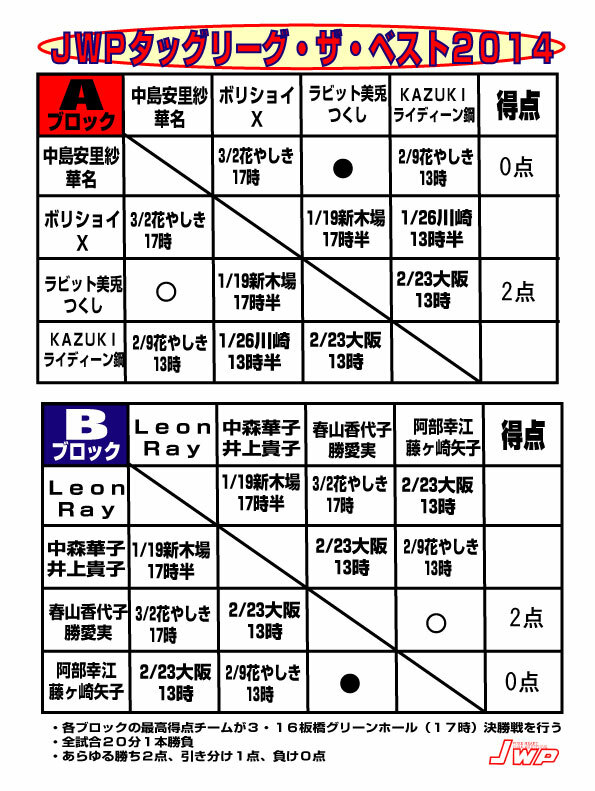 ►JWP(January 5, 2014): KAZUKI def Raideen Hagane / Command Bolshoi def Neko Nitta / Hanako Nakamori def Leon /Kayoko Haruyama & Manami Katsu def Sachie Abe & Yako Fujigasaki / Rabbit Miu & Tsukushi def Arisa Nakajima & Kana. ►Chiseled Chase def Santana Garrett(c), Josh Hess and Lince Dorado at I Believe In Wrestling's "BELIEVE 62"(January 5, 2014). ►SENDAI Girls(January 5, 2014): Ray def DASH Chisako / Ayesha Ray def Sakura Hirota / Meiko Satomura def Takumi Iroha / Hiroyo Matsumoto def Kagetsu / DASH Chisako & Sendai Sachiko def Tsubasa Kuragaki & Kellie Skater. ►Aksana & Alicia Fox def Brie & Nikki Bella on Monday Night RAW(January 6, 2014). ►AJ Lee(c) def Kaitlyn on WWE's Main Event(January 8, 2014). ►Leah Von Dutch vs Jennifer Blake vs Jewells Malone at Conflict Wrestling on January 11th. ►Barbi Hayden vs Justine Silver at UPROAR Pro Wrestling's "Collision Course" on January 11th. ►Jordynne Grace vs Mickie Knuckles at IWA Mid-South on January 11th. ►OZ Academy on January 12th: Aja Kong & Dynamite Kansai vs Mayumi Ozaki & Mio Shirai/ AKINO(c) vs Sonoko Kato. ►Katarina Leigh vs Cheerleader Melissa at Wrestling Cares Association on January 15th. ►RESISTANCE Pro's "Vulgar Display Of Power" on January 17th: Mickie Knuckles vs "Crazy" Mary Dobson/ D'Arcy Dixon(c) vs Thunderkitty. ►Portia Perez vs Kimber Lee atWrestling Is Fun! "The Wild Bunch " on January 18th. ►Veda Scott vs Portia Perez at Wrestling Is RESPECT on January 19th. ►Jessie McKay vs Kellyanne English at PWA's "Robbie Eagles Vs The World" on January 25th. ►Women Superstars Uncensored's "Mutiny" on February 8th: Jessicka Havok(c) vs Shanna/ Allysin Kay(c) & Sassy Stephie(c) vs Kimber Lee & Annie Social/ Candice LeRae, Joey Ryan, LuFisto, Athena.